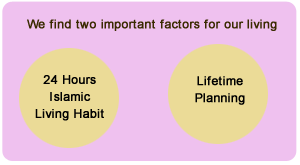 The title is unique "24 Hours Islamic Living Habit and Lifetime Planning". This Principle is adopted into Unity Islamic Diary. One has to plan for lifetime, but one has to live for the day now. A habit is developed by repetition of thoughts and actions. If life is based on Truth and reality and your thoughts and actions are continuously repeated it becomes a good habit on a straight path. Developing Islamic Living Habit is the best choice for eternal life. Unity Islamic Diary is a combination of Psychology, Modern Time Management Techniques and Islamic Ideology. Normally, a diary is to keep track of daily routine and events for applications. It enables to keep one's timetable, meetings, and appointments etc. It also helps us to record personal experience and events. In Islam we find lofty messages as guidance for applications. Unity Islamic Diary acts as a guide and practical record for successful living. The objective is to take the maximum advantage of the inherent strength of Islamic philosophy for everyday living. 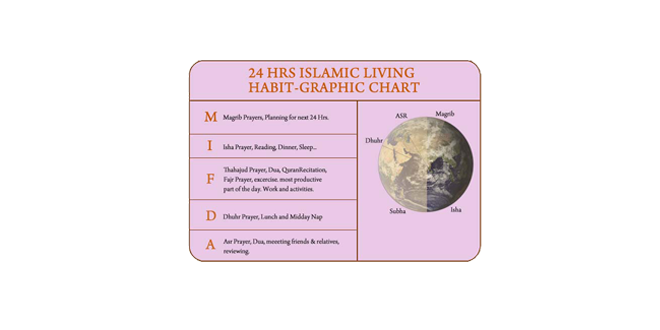 Elaboration of 24 Hours Islamic Living Habit & Lifetime Planning. 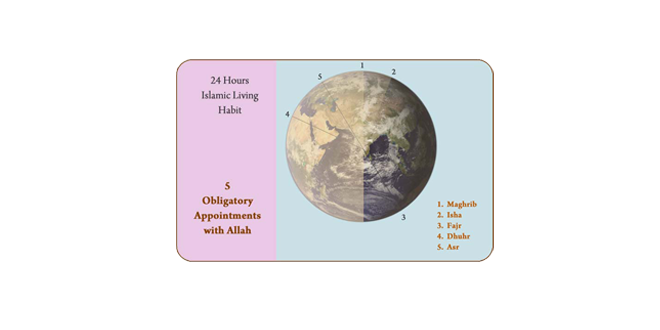 24 Hours Islamic Living Habit and Lifetime Planning- will be a major shift in paradigm in your thinking and living. Unfortunately, we are ignorant of the Natural System laid by Almighty Allah for successful living. This is just an exploration of the hidden technique, to practice for everyday successful living. The idea of this technique is applied from the beautiful verses of the Holy Quran. One is an important Dua frequently recited by Muslims. The transliteration and the translation of the verse runs as below "Rabbana Aathina Fid-Dunya Hasanathau Wa Fil Akhirathi Hasanathau Wa Qina Azaabannaar"
The above verse clearly explains that our attitude should neither be to renounce this world nor to be so preoccupied in it so as to forget the life Hereafter. We can find three important Messages in this verse. * To save ourselves from the punishment of hellfire in the everlasting eternal life. * To earn and attain Paradise in the everlasting hereafter. * To seek all the good things of earthly life. "Wal Asr. Innal Insaana Lafee Kusr. Illalazeena Amanu wa Amilus-Swalihati Watha Wasaw bil haqque. Watha Wasaw Bis sabr." This Chapter encompasses a wide meaning in the minimum words. It contains a very deep message and hidden wisdom for mankind and makes man to understand true success. It focuses mainly on how the people are lost at the lapse of time or at the evening of the day or the short journey that he traveled on the planet earth. The time that he traveled on the planet earth. The time that he passes cannot be recaptured again. Time is a resource, which is freely available to all for investment. To utilise time is a real investment unknown to many. The real asset of Man is time. When a man makes his day’s account in the evening, it will show a loss. It will show profit or success only if it satisfies the four essential prerequisites. * Absolute faith in the Almighty Allah with Unity in Purity with Humility and Accountability. * Good deeds based on the light of Holy Quran and Prophetic Traditions. * Good actions are positive and productive. * Good for himself, fellowmen and the whole humanity. * Muslims are recommended to perform good deeds. Ethics lies at the heart of Islamic teaching. * One must exhort with other to Truth. * Truth should be the basis of analysis and approach in every human activity. * Truth is the governing principle of the Universe. * To follow Truth is to Obey Allah. * Truth is the origin and destination of all personal and interpersonal interaction. * Sabr means to think of Allah before every reaction. * To be steadfast in patience in all interpersonal relationships with a hidden goal of accountability to Allah. * We should cultivate and practice patience and tolerance in all our activities. * Sabr increases one’s earning for Aakhir (Hereafter). This comes from practicing the Islamic principles of attitude and behavior. None of the four can be removed and are conditionally indispensable. If we do not possess these four essential prerequisites we will be at great loss. 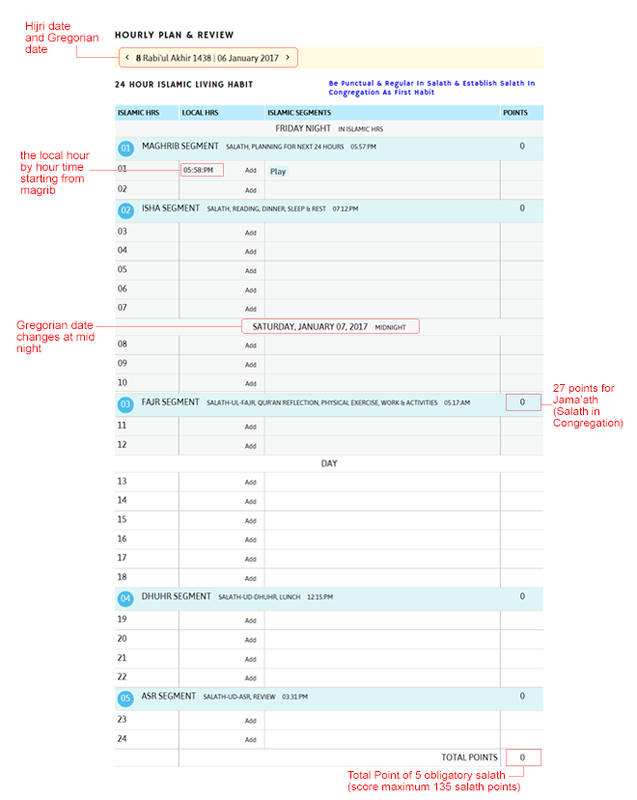 Normally in the modern time matrix planner, we see that only the day is activated for action and the night is ignored. Whereas in Islamic Time Planner it encompasses all the twenty four hours - day and night. In Islam sunset is the starting point but in modern system the day begins at midnight. Therefore a great advantage in Islam is the day starts at Magrib and ends before Magrib - the night before the day - i.e. planning before actions. Every one is busy in his daily activities. But one should be really busy with Obligatory Prayers. Salath makes the other things easy. In Islam, the first step for success is five Obligatory Prayers. When we stand for Prayers we recite the Iqamah where we use the word Hayya-lal-Falaah meaning “Come for Success”. In Islam success is easy because of certain Obligatory Duties that have to be performed like Salath. The top priority of the day is five important Appointments with Allah. They are five times Prayer (Salath-Obligatory Prayer) in areas of Prioritization with specific time, norms and procedures. Normally, appointment with anyone in this world requires lot of preparation but appointment with Allah is Supreme. This automatically divides 24 hours into 5 segments. Each Segment begins with the Call of Azaan and Salath. I. 'Magrib Segment' commences at sunset with the Azaan and ends at the time of Isha. This gives you the time for planning for the next twenty-four hours, hour by hour. The Obligatory Appointment is Magrib. II. 'Isha Segment' follows immediately at the time of Isha up to a few hours before dawn. The Obligatory Appointment is Isha. Here you have the time to read. dine, rest and sleep. IV. ‘Dhuhr Segment’ starts just after the noonday when the time is for Dhuhr. Obligatory Appointment is Dhuhr Salath. Followed by lunch, midday nap and to continue activities again. V. ‘Asr Segment’ commences at the time of Asr till sunset. This time can be utilized for Zikr and Dua. In addition this time can be used for Dawah activities like interaction with friends, relatives’ etc. Obligatory Appointment is Asr Salath. In the Day Planners you will have strong Capsules - Verse from the Holy Quran and Quotation from the Hadees. This is mainly introduced in order to have reflections and closeness towards Allah. 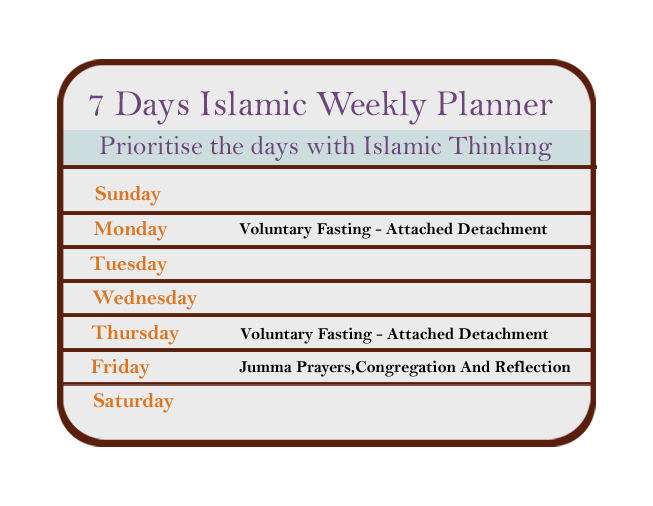 Planning for 7 days by prioritising the days with Islamic thinking. Voluntary fasting on Mondays and Thursdays will help to have Greater attachment with Allah. The Most important part of the week is Friday, where Juma Prayer is Obligatory for all Muslims with social interactions. Where the past decades are reviewed for reflection. The future decades can be panned for the possible actions in advance for our lifetime. You can plan on your future work, home, education, Haj, Umrah etc. One must plan to live for hundred years but must be prepared to meet death at any moment. 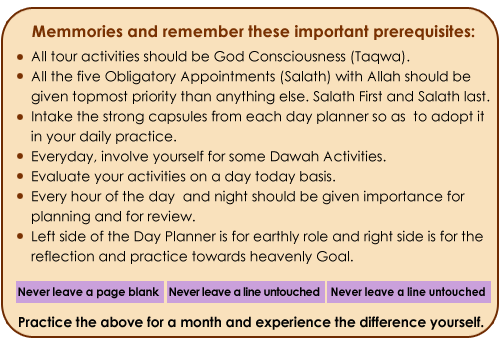 Unity Islamic Diary which includes ‘24 Hours Islamic Living Habit and Life Time Planning is the Seventh Principle. If followed systematically with True Islamic Spirit every step will be profitable both in this life and hereafter. 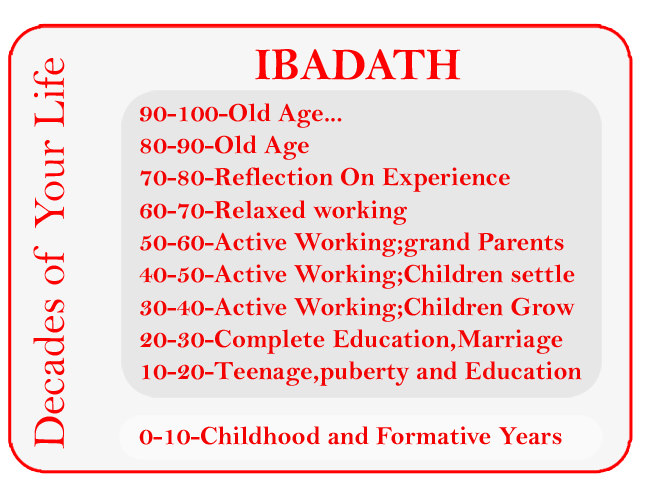 This systematic Islamic way of your life is earned and deposited as ‘Ibadath’ for the hereafter.